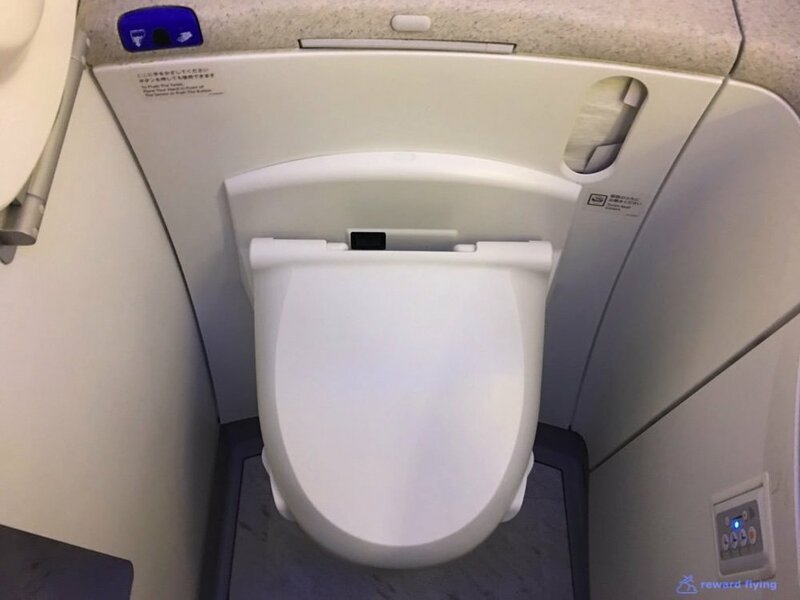 Japan Airlines has installed the B/E Aerospace Apex business class seat in their newer international 787s along with their long haul 777s. On a quest to try all business class seat variations, I was looking forward to this flight. Also having flown ANA a few times recently, making a comparison was something I thought would be interesting as well. In the end, JAL was the only one that remained the same. American switched out the 787 for the dreaded A321 to Dallas, Cathay Pacific switched out the A330 for an A350 (Yes! ), EVA ended up being on a 777 as I flew standby earlier in the day and I switched to United's 747 Polaris First for the return. But the flight was on time so while hungry (turns out to be a good thing) I headed over to DFW's international terminal. There she is tucked inside a KE777. JAL releases a fair amount of reward space. However, expect it to go quicker now with Alaska being a partner and searchable on AK's website. American doesn't provide support for JAL rewards, nor does ExpertFlyer. Prior to Alaska you had to use BA, QF or JAL's own site to search for rewards. The one-way fare for this complete ORD-TPE route priced out at $5,600 in business class. It was booked under the old AA program for only 55,000 points. That's 10 cents a point in redemption value. Of course such bargains are gone, almost. Even after the devaluation it's still only 60,000 points for this route. Still a great bargain. You have to contact American to book this flight. Fees are waived because you can't book it online. I stopped in the DFW Admiral's Club lounge for a minute. There really isn't a need to show any photos. Now the JAL Sakura Lounge is a different story. See the NRT-HKG post for that review. JAL's business class cabin is split with 3 rows of 6 seats between doors one and two on this 787-8 and a second 20 seat cabin aft door two. A peek at the second cabin. I had reserved the front cabin in row one. Once on board I was certainly happy with that choice as it was far quieter having fewer occupants. In fact it was less than half full while the back cabin was close to full. 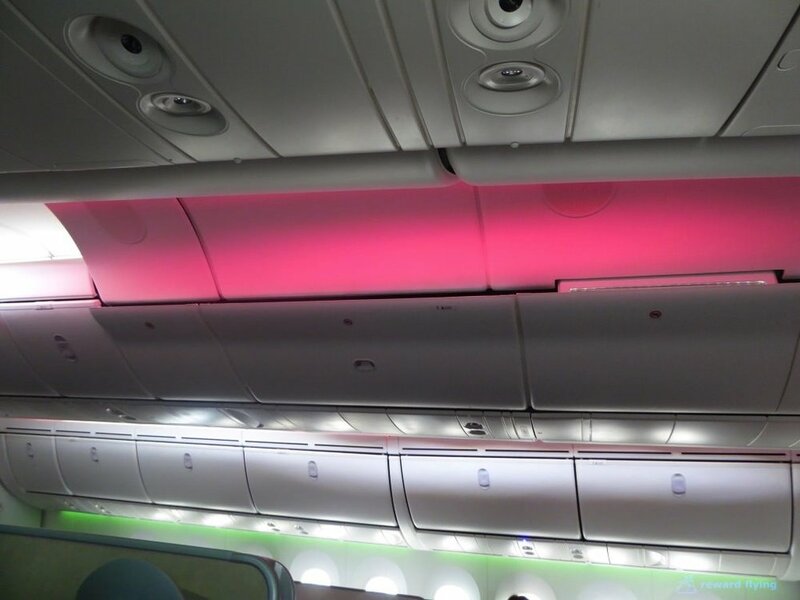 Have to love the 787 overhead bins. 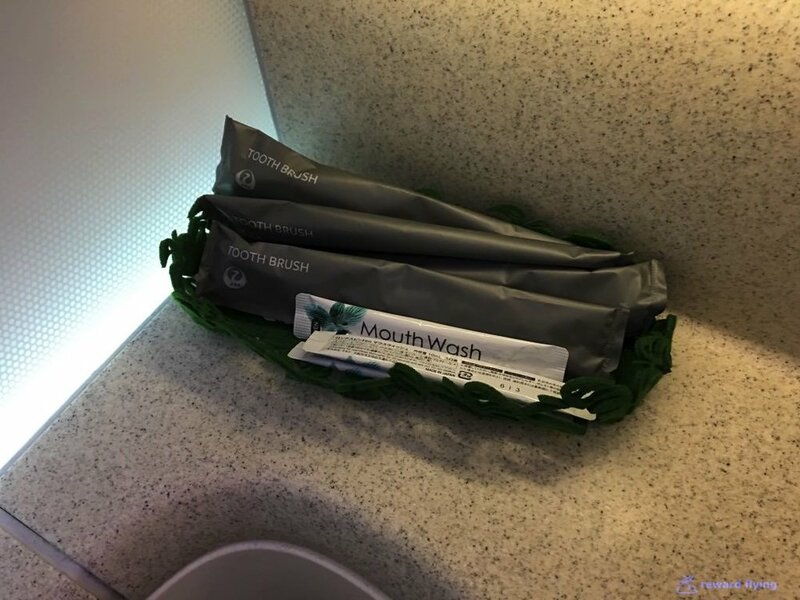 Stock lavatory not particularly well supplied other than toothbruses and mouthwash. At door two there is a self serve bar which was only serving water today. Mood lighting. It's Christmas time! Notice there are no overhead bins above the center seats at rows one and two where the crew bunk is located. I have mixed feelings on the Apex seat. To begin, it is the most private seat available in any business class configuration on any airplane, if you have a window seat. But if you have an aisle seat you're not as secluded. A view across row one with the privacy divider open, as is required on take-off and landing. When closed it's your own mini compartment. The width of the compartment is basically the width of the seat, about 25 inches. That is a nice width for a seat, but for everything? The reading lamp is literally next to your ear. 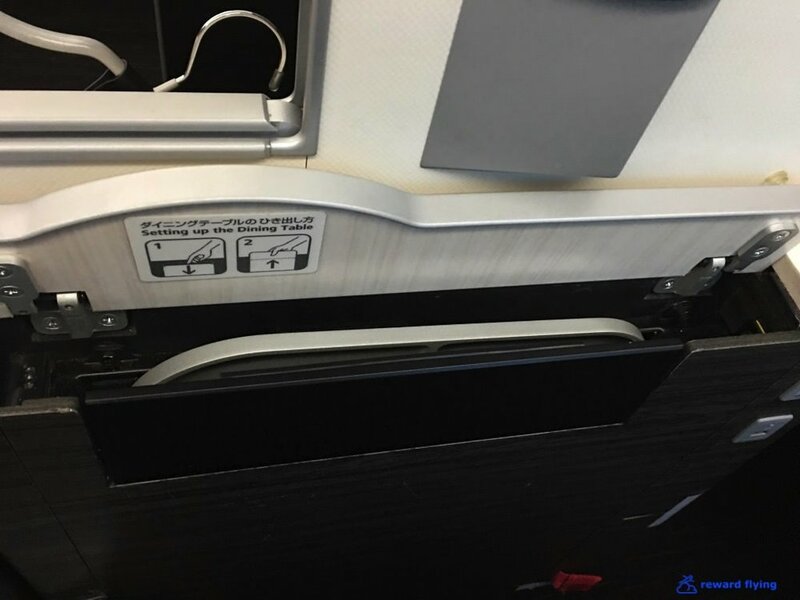 The power plugs are at the front of the compartment on window seats with no place to put the plugged device. There is a table in the entryway to the compartment, but you can't reach it while sitting down. For window seats your table storage area is the width of a water bottle. Privacy partition drawn shows the compartment closed off. Aisle seats have this little cubby hole with the power outlets below. There is also a storage bin above covered by mesh that I guess can be used, but I'm not sure for what and by who. It also has a hook for your headphones, which the window seats do not have. The ottoman has storage underneath plus a small tray below the monitor. You can't reach it from the seat. 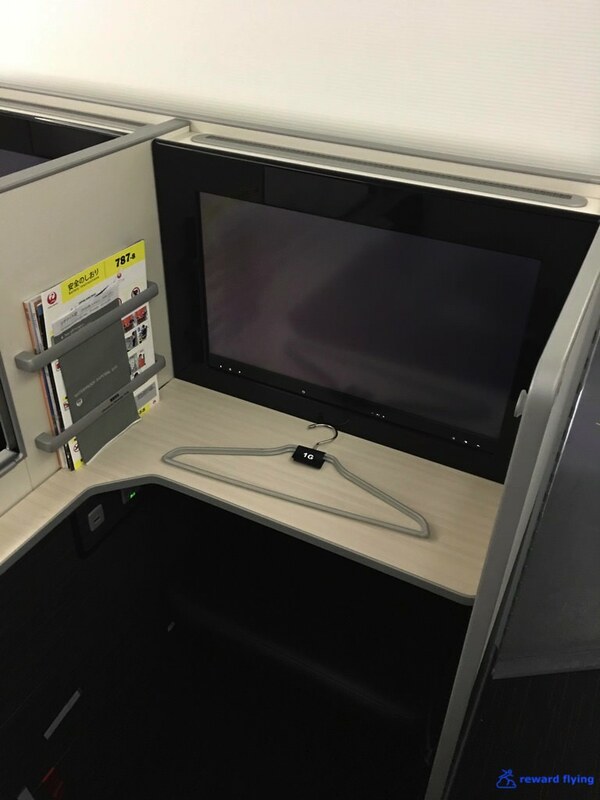 Magazine / Placard rack is next to the monitor with different placements for window and aisle seats. 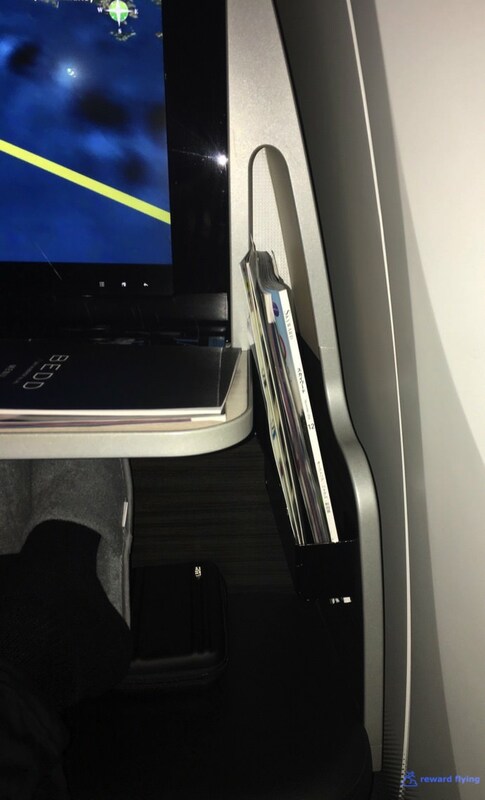 A large meal tray is stored vertically to the seat. So here is a test to see if you will like the seat compartment. Either sitting or laying down, clasp your fingers behind your head with elbows sticking straight out like wings. If you are an average size person you won't be able to do this in the compartment. If you're okay with that, then you'll be fine. 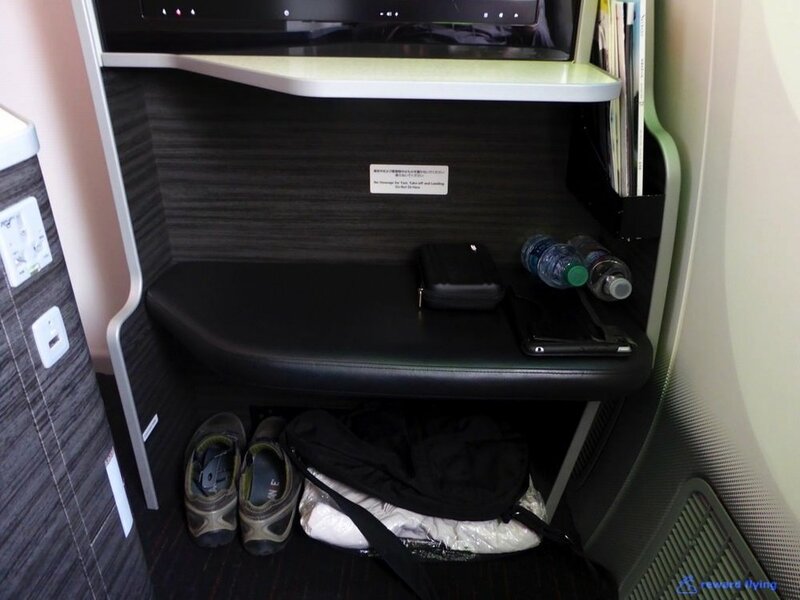 That blue items stored in the overhead compartments are mattress pads which are called Airweave. Apparently the business class version is different from the first class version that has a soft and firm side. I don't know for sure as no information was provided on the aircraft. In fact when I asked a flight attendant for the bed to be made, she simply pointed to the bin and said my mattress was up there. So I made the bed. From the foot of the compartment you lay out the mattress pad, soft blanket and crawl up to place the pillow that covered the width of the bed. Good luck trying to place the blanket as a bottom/top sheet, maybe that's why the FA wanted nothing to do with making the bed. I was unable to sleep. It just was too confined. The more I think about the seat the more I dislike it. Sure the privacy was great, but I simply found it too confining. A Zero Halliburton (Asian luggage maker) amenity kit was provided that was sparsely populated. It was more of an advertisement than product. There were no creams, just lip balm and a VIP Discount coupon on Institut Karite Paris products. You could also borrow a cardigan style sweater to wear that was more comfortable than ANA's version. The ever popular airline choice of Charles Heidsieck champagne was featured. Interesting that they have a special cocktail for the Dallas route. Gin based, not for me. My guess is the flight attendants don't care for these compartments either. Maybe they should hire left handed ones to work the right side and right handed ones... I digress. Why does Western get a photo? To begin a light and delicious Sakizuke (the Japanese word for the French word amuse-bouche) was offered. If the rest of the meal was as good as the starter then I was in for a treat. And the mini-bento box inside the large bento box. Note, Lobster and I don't get along so I requested they remove it from this dish. For my sake I was lucky there wasn't any language misinterpretations. And that was the appetizer. The Rossini-Don original rice bowl piqued my interest. I pressed the Order Food button on the IFE controller. I got up to stretch and found a flight attendant and asked for the "original rice bowl" as it is described on the menu. She didn't understand. Rossini-Don and a green tea got the job done. Then a few hours later it was time to take another look at the anytime menu. Hmmm. How about a chicken sandwich. It was dark so the photo doesn't do it justice, but I never would have expected a sandwich this incredibly good at whatever time of day, or day for that matter, it was 40,000 feet above the Pacific ocean. We aren't done yet. Might as well stick with Japanese. Would there be a let down? Although I'm glad I ate too much earlier as it wasn't the largest of portions. And since I was on a roll I did what I almost never do. Food alone is close to a 10. It's almost too big, the monitor that is. A 23 inch LCD making as wide as the seat. Comfortable noise cancelling headphone. The need for these are becoming obsolete with aircraft like the 787 and A350 as these planes are eerily quiet while flying. One annoying aspect of the airshow was that if you changed a setting, for example having that ticker run on top, each time you exited the program and came back you had to reset any changes you'd made. You couldn't save them, or at least I could save them. While the FA's were plentiful and responded quickly to requests, they weren't necessarily pro-active. I usually had to ring the call button for something, which is fine. Fortunately there weren't any problematic language barriers. The only issue was the bed. Pointing to the mattress was not the way to deal with making the bed up. In my own competition I can't decide between the B787 and A350 as my favorite. Both aircraft are quiet, smooth and with the higher pressurization and humidity you really feel better after a long flight. At least I do. That said I'm leaning towards the 787 because of the windows. Here are some cool views this winter day over North America and descending into a stormy Japan. 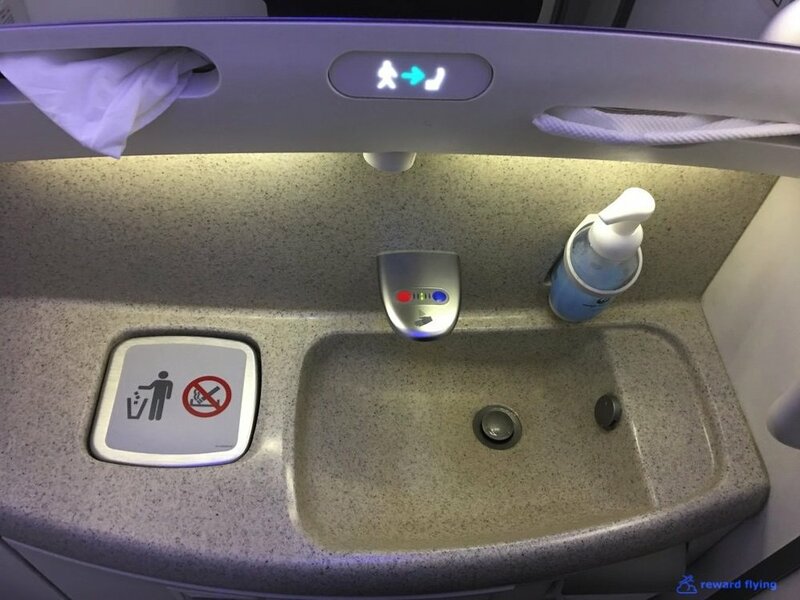 Comments: While the seat wasn't at the top of my list for comfort in business class, the food and IFE made this a great flight and I'd happily take JAL again, anywhere. 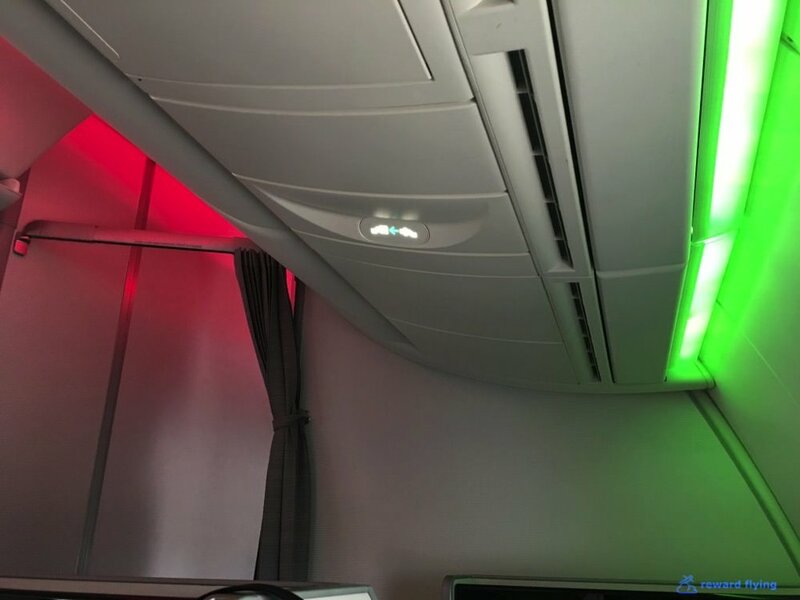 Especially on a 787.